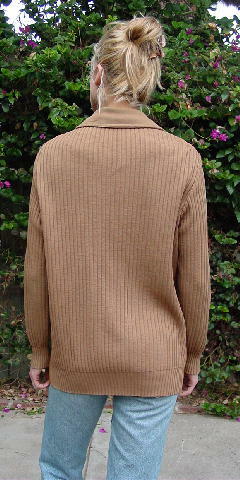 This vintage early '60s 100% wool sheep suede sweater-jacket was made in Israel. 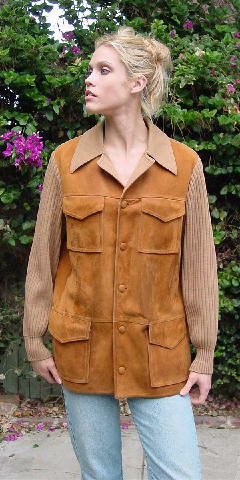 It has 4 flap pockets and 5 suede buttons down the front. It has a light golden orange lining which has some dark (wear) discoloration, and the left inside 1-button pocket had been mended. There is a spot on the right side below the 4th button toward the pocket. The right sleeve has a few dark spots, as does the fabric on the inside by the button holes on the right side, and there is some darkness to the suede below the left side upper pocket. There is some discoloration on the inside of the back collar. This sheep suede is unbelievably soft. It belonged to a male model (think young Russell Crowe) who wore it in a photo shoot and liked it so much he bought it. He wore it for 2 seasons when he modeled in Europe.